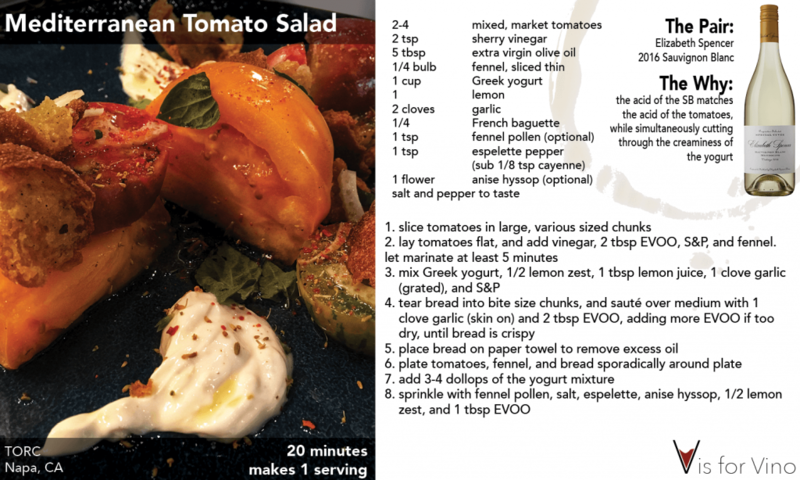 This recipe for “Mediterranean Tomato Salad” with labne is best with farmers market tomatoes; the fresher the better! 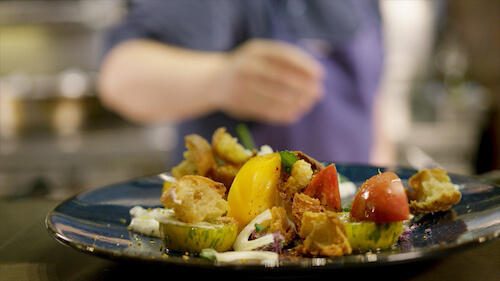 Watch the video to see Vince and Chef Sean of Torc restaurant make the prettiest (and dare I say, tastiest?) tomato dish you’ve ever seen. Or keep reading to get the recipe! 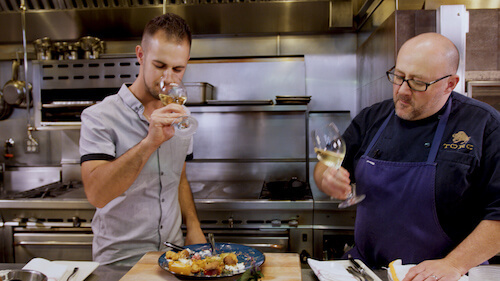 And to get this recipe plus 5 MORE FREE, check out our “6 Killer Resturant Recipes and Wine Pairings Video Guide“! 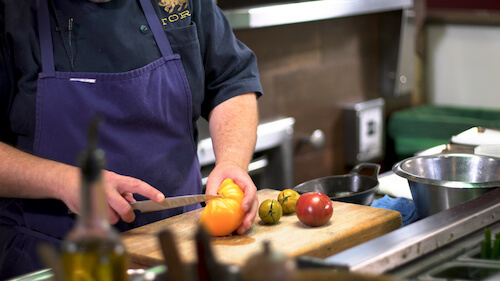 Your tomatoes should be as fresh as possible, or as Chef Sean says, “never refrigerated”. Head to your local farmers market! The skins should be tight, and the tomato should yield slightly to the touch. As for what kind? Go for variety! Green Zebra, Purple Cherokee, yellow, red, green, polka-dot; go crazy! Different textures and sugar/acid levels are what make this dish unique. the fresher the better; never refrigerated is best! 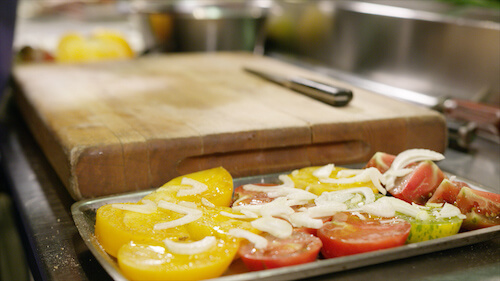 When slicing tomatoes, go for large, fork-and-knife chunks in a variety of different sizes and shapes. Let the tomatoes marinate in olive oil, sherry vinegar, salt, pepper, and some thinly sliced fennel. The salt will tenderize the tomatoes, and allow them to take in the vinegar and oil. What is labne? Nothing more than strained (through a cheesecloth) greek yogurt. If you can’t find it at standard a grocery store, a middle eastern shop would have it. But it’s perfectly acceptable to use greek yogurt instead (especially if it’s already in your fridge!) The grated raw garlic gives the yogurt the appropriate amount of bite, while the lemon juice adds a nice acidity to the yogurt. 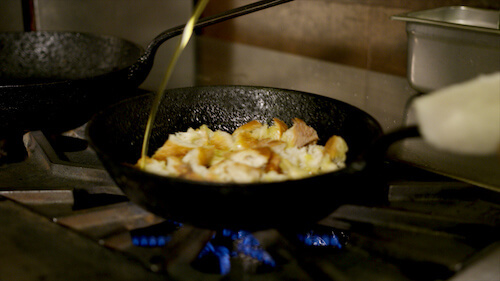 Add a few cloves of garlic, pressed and in the skin, to lots of olive oil over medium heat. Leaving the garlic in the skin prevents it from burning and getting bitter while still flavoring the oil. Add some day old french bread; bite-size craggly chunks are perfect. If they seem dry before they’re toasty, just add a bit more oil. When they are crispy on the outside but still chewy on the inside, drain them on a paper towel to remove excess oil. Now it’s time to wow your guests with the presentation! 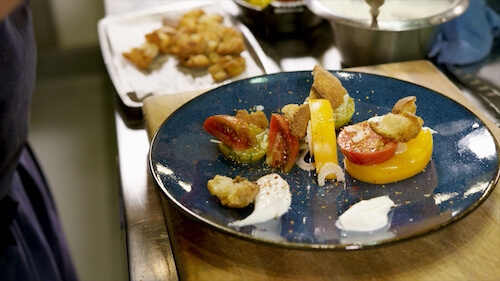 Arrange the tomatoes, fennel, and croutons sporadically on the plate; flat, sideways, longways, and stacked. Add a few dollops of labne and drag your spoon through them, as if to encourage the tomato to do the same. Finally add your color: espelette, fennel pollen, lemon zest, and anise hyssop. If these are a bit tough to find, sub cayenne for the espelette, and some fresh chopped sage and mint for the anise hyssop. Chef and I paired this with a juicy, floral, Sauvignon Blanc from Elizabeth Spencer Winery. GET IT HERE! 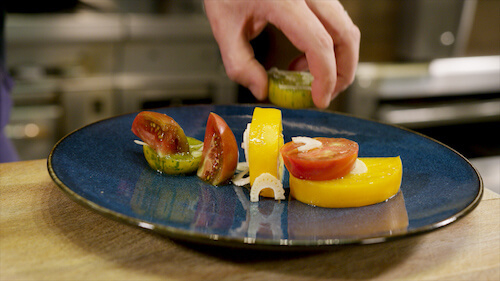 The acidity in the wine can stand up to the acidity in the tomatoes while cutting through the fatty yogurt, while the floral, citrusy SB notes complement all the fresh herbs and lemon.